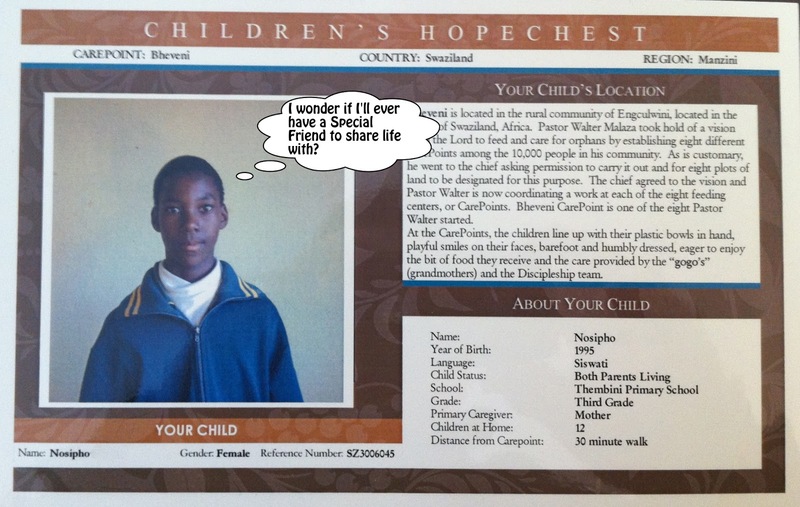 This week, in addition to Mcobi and Mxolisi, I'm praying for Nosipho to be found by her special friend. 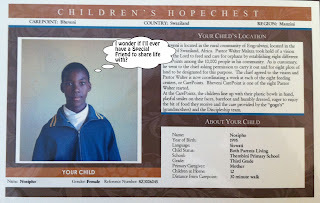 Will you join me in praying for, and spreading the word about Nosipho? She is another of the lovely children at Bheveni Carepoint. She is about 16 years old, and likely in 4th or 5th grade by now. Like the 150 other children at Bheveni Carepoint, she regularly walks for about 30 minutes from her homestead each day for the chance to have a warm meal or two. Add the walk to and from school and it's likely she is walking 10K (6.2 miles) every day. The children and I are very thankful for those who will financially support Bheveni Carepoint so that it is able to consistently provide the food and attention that each of these children need to survive and thrive in their harsh surroundings. Please pray for those of us who are able to take action. Pray for people to come alongside Bheveni through sponsorship. Pray about your involvement. Could you sponsor? Could you connect Nosipho with another who would be her special friend? Would you consider sharing Nosipho, Mcobi, and Mxolisi's stories with others in your world? Maybe friends in the neighborhood, your department at work, or your church youth group? Step up and believe with me for Special Friends to connect with these wonderful children. People who will make sacrifices of their time and resources to instill hope into the lives of those in tremendous need. Sponsorship is $34 per month, an amount that is easily offset in many of our lives. Would you consider, and pray for others who would: give up a couple cups of coffee per week in exchange for the joy of knowing what a difference your support can make? Would you like to sponsor, or know another who does? Please email me by clicking here and note the name of the child you'd like to connect with. Please comment here and let me know if you share or are standing with me. I so appreciate it! Please take moment by clicking below and sharing this story with your network. Tweet it, post it, +1 it...shout it out. Thanks again!